A strategic guide to privateering in South America and an illustration of the world's first stock bubble. A new & exact map of the coast, countries and islands within the limits of ye South Sea Company, from ye River Aranoca to Tierra del Fuego, and from there through ye South Sea to ye north port of California, &c. with a view of general and coasting trade-winds and particular draughts of the most important bays, ports, &c., according to ye newest observations, by Herman Moll Geographer. One of Herman Moll's most interesting and influential maps. Issued c. 1719 – 1720, at the height of the South Sea Bubble, this is Moll's map illustrating the limits and goals of the South Sea Company. Centered on South America, this map covers from Florida to Tierra del Fuego and from an insular California to the coasts of Africa. The South Sea Company was a British joint stock venture charted near the end of the Spanish War of Succession (1702 – 1714). Ostensibly, Britain, which was beginning to gain an upper hand over Spain, founded the South Sea Company to disrupt and ultimately seize control of Spain's trade wealth in the Americas. Under John Blunt and Robert Hartley, England's Lord Treasurer, the South Sea Company was granted exclusive trading rights to all commerce in Spanish America. The trading rights granted to the South Sea Company presupposed a British victory in the war, which did not occur until several years later in 1813. Though not as grand or extensive as originally hoped, the 1714 Treaty of Utrecht granted the South Sea Company limited trade rights in Spanish America as well as the coveted Asiento, the contract to supply African slaves to the Spanish colonies. At Jonathan's Coffee House, an early version of Wall Street, Moll's circle of influential financiers, educated pirates, and talented promoters launched a campaign of propaganda in support of the South Sea Company. By mid-1720, despite engaging in little or no commerce, rabid speculation had pushed the per-share value of South Sea Company to over £1000 , creating the world's first recorded stock bubble. Around September the bubble burst, with the stock price crashing to under £100 per share, causing a rash of bankruptcies as those who bought on credit scrambled to liquidate their stock. Moll himself is not known to have earned any money from directly speculating on the South Sea Company, however, his timely issue of illustrative maps and other publications no doubt turned a handsome profit. Moll's map was issued in response to popular interest and is intended to illustrate the ambitions of the South Sea Company. Focusing on South America, Moll' s map details continent embraced by the South Sea Company's 'Sea Limit,' a line running roughly from the Rio de la Plata, around Cape Horn, and north, along the western shore of America to the uncharted lands north of California. The map is further surrounded by twelve smaller inset maps. These can be divided into three categories: access points to the Pacific, islands of refuge, and treasure ports. The map's mission thus becomes clear. Moll's map, by design and content, suggests a strategy for seizing control of Spanish trade throughout the Americas. South Sea Company privateers crossing into the Pacific via the access points at Darien (Panama) and the Straights of Magellan, could use the unpopulated islands of Peypses (actually apocryphal, but it bears an uncanny resemblance to the Falklands), Juan Fernandez, and the Galapagos, as bases to seize control of the contested ports of Baldavia, Guiaquil, Amapalla, and Nicoya. From these ports the British could not only dominate the internal trade, but also harass the Spanish Pacific fleets sailing from the treasure port of Acapulco. The sub-context of Moll's map of the South Sea Company also can be read in the light of the Asiento, or slave trade. With the coast of Africa appearing at the right and trade winds clearly indicated, one can follow the slave route from Europe to the coast of Africa, to the mining and agricultural ports in South America that most needed slave labor. In the course of roughly 30 years of trade, the South Sea Company transported some 34,000 slaves to South America, a prodigious number though far short of the mandate contracted the by Asiento and the Treaty of Utrecht. Cartographically Moll's South Sea Company map is loosely based on Edmond Halley's chart of magnetic variation, the isogonic lines of which appear on this chart. The general shape of South America is drawn from Mount and Page, who published a chart of South America based on a projection prepared by Edward Wright. A few of the insets Moll extracted from his own earlier work publishing the journals of his gentlemen pirate friends, including Dampier, Funnell, Hack, and others. Some of the more interesting charts, including the three large maps at the top of the page, were added in this, the second edition of the map. These maps, as well as the map of Acapulco and the Galapagos, were extracted from manuscript maps copied from Spanish charts seized by the privateer Captain Sharp from the Spanish ship Santa Rosario. These were copied by Moll's coffeehouse friend, the pirate William Hack. Though commanded by the king to keep these documents secret, lest a rival nation use them to their advantage, the presence of these maps on Moll's chart clearly indicates the difficulty in keeping cartographic information secret. Moll initially published this map in 1711 to illustrate his propagandist pamphlet, A View of the Coasts, Countrys, & Islands within the Limits of the South Sea Company. 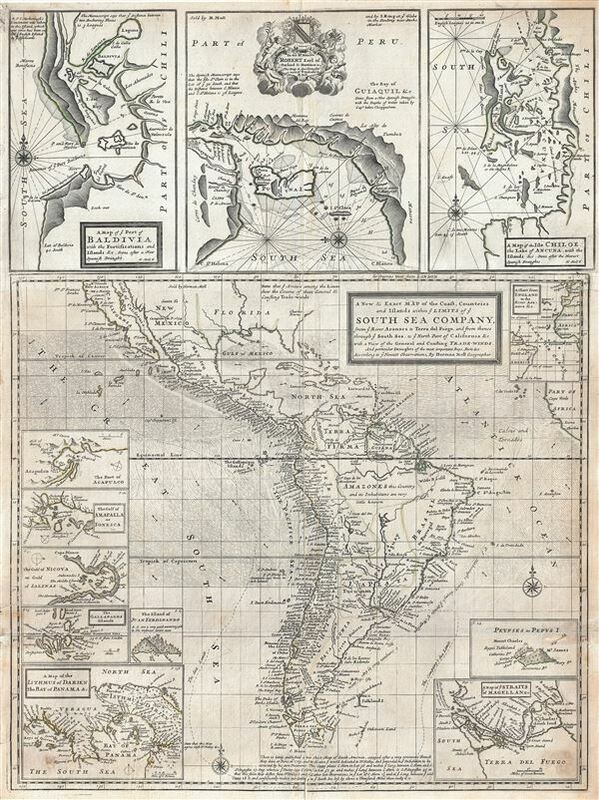 It was later revised in a second edition, published around 1719 or 1720, to include the three additional maps of Baldivia, Guiaquil (Peru), and Lake Ancuna. Another third edition appeared much later. This, the second edition, appeared in a number of different publications and was also issued independently, but most examples can be traced to Moll's 1719 – 1720 New and Complete Atlas. Moll, H., A New and Complete Atlas, c. 1720. Good condition. Overall toning and brittleness. Some older verso repairs along original fold lines. Blank on verso. McLaughlin, G., The Mapping of California as an Island: An Illustrated Checklist, 181, state 2. National Library of Australia, 1726 MAP RM 109. Shirley, R., Maps in the Atlases of the British Library vol I, T.Moll-4b, 12. Hutchinson, G., 'Herman Moll's view of the South Sea Company,' Journal for Maritime Research, 2003. Reinhartz, D., The Cartographer and the Literati: Herman Moll and his Intellectual Circle. Boston Public Library, Leventhal Collection, G5200 1711 .M65.